Toaw4 is a classic wargame simulator that covers a large range of conflicts from WW1 to Modern era. I personally had the pleasure to get a copy of TOAW2 during summer holidays in August 2000. After that, TOAW3 and TOAW4 came with new interfaces and innovative dynamics. I think it is time to dedicate a deep and detailed AAR to TOAW4 and explore its tactical and strategic capabilities. First, lets start with a relative short scenario of 26 turns, each turn represents a day and each hex represents 10 km. 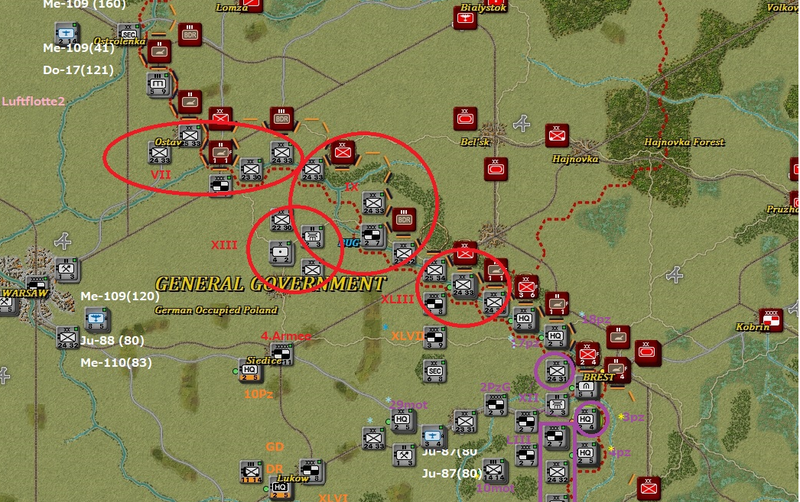 The scenario deals with the attack of the Army Group Center with the objective to destroy the Red Army and reach beyond Minks as fast as possible. 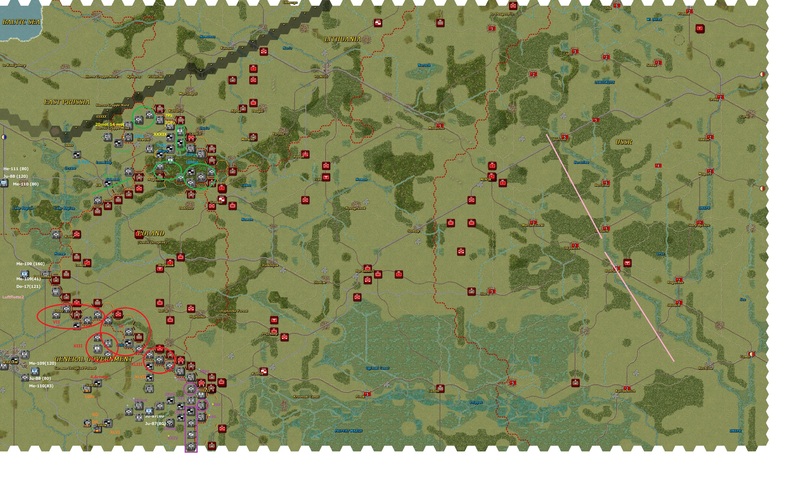 See a closeup view of the North area of Army Group Center composed of 9th Army and 4th Panzer Army. Closeup view of the South Area with the 3rd Panzer Group and 4th Armee. A total of 11 air wings composed the 2nd Luftflotte as air support of the Army Group center. The total number of planes is around 1,000 including Bf-109, Bf-110, Junkers J-88, Heinkel He-111 and two Ju-87B Stuka air wings. 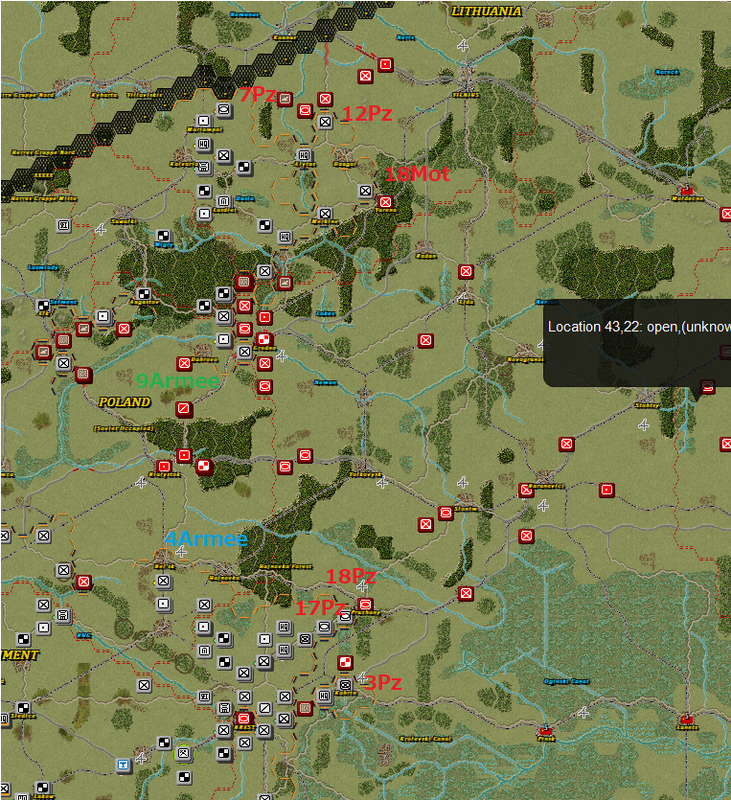 TOAW4: South area of the AGC composed of 4th Army and 3rd Panzer Group. Global view of the front line. The final objective line is denoted in pink continuous line at the right hand side beyond Minsk city. 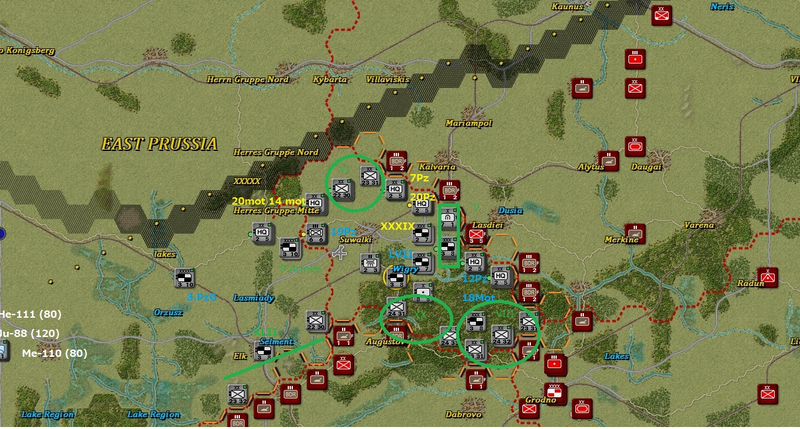 TOAW4: Road to Moscow starting front line. Severe loses for the Soviets after first turn. 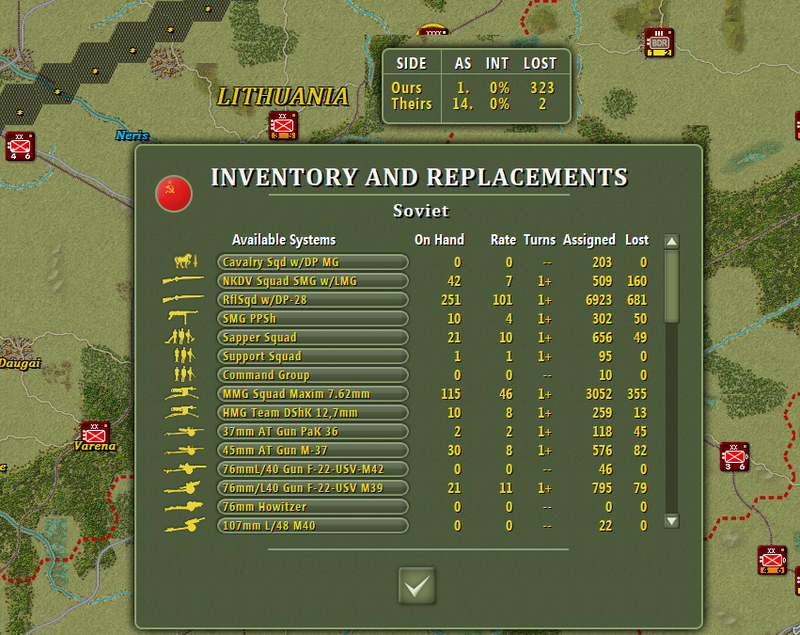 A 10% of the total rifle infantry squads and artillery. After turn 2, the German panzers advance to encircle soviet forces at Minsk. An inner encirclement will be formed by the 4th and 9th Armies. Loses after turn 3, mostly done in South area, in an encirclement of multiple Soviet divisions in a town close to border. The total loses of Rifle infantry squads are now close to 50% of the total force. The tanks divisions suffered severe loses, and more than 66% per cent of T-26s tanks were destroyed or captured. 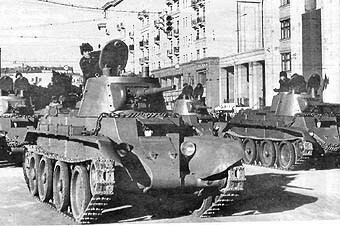 The armor forces are therefore reduced to 100 KV-1 and 200 T-34/76 tanks and some hundreds of lighter BT-7. Situation after turn 3. In the north, the Germans are near Vilnius. They just need to turn southeast to reach Minsk around 100 km away. In the South, the resistance of Soviet tanks at Pruzhany is broken. However, the damaged and broken railways can be a problem for German supplies. How fast the Germans can repair these railways is still unknown. So far very interesting game! I can’t wait to move forward. Any hints/ideas for strategic operations are welcome! 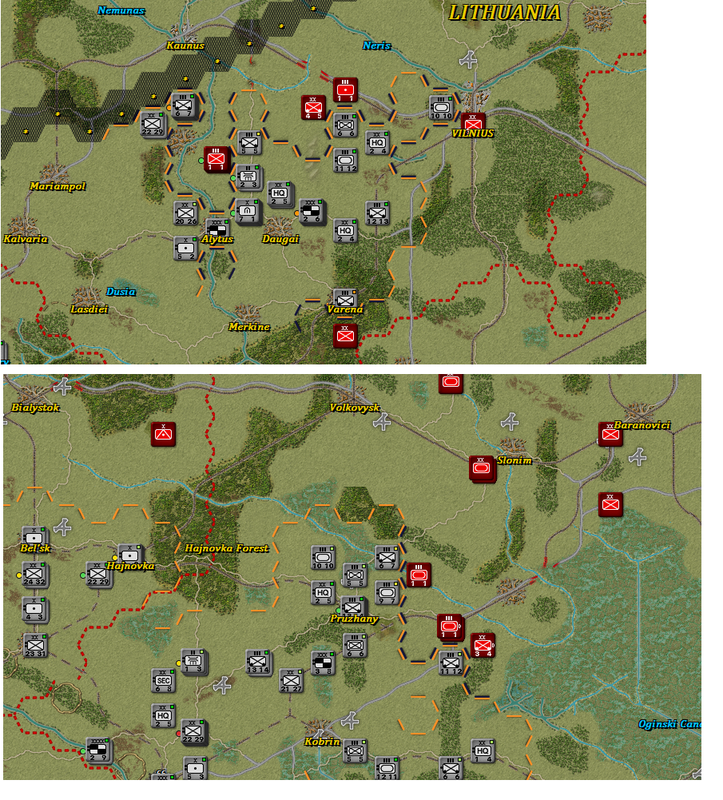 Just write something or forward to friends interested in TOAW4 wargame too!